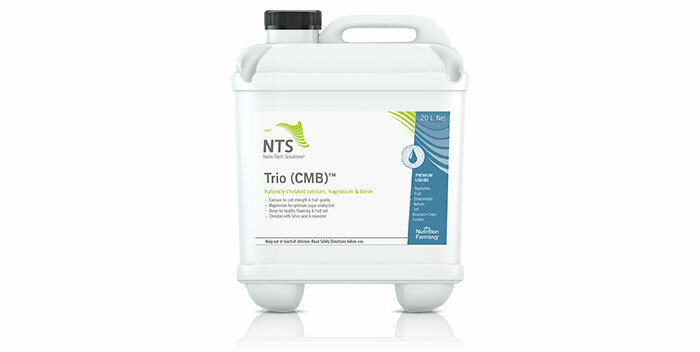 Trio (CMB)™, one of NTS’ most popular liquid fertilisers, is now available in a formulation conveniently suitable for both foliar and fertigation applications, superseding our previous versions of Trio (CMB) Foliar™ and Trio (CMB) Fertigate™. Trio (CMB)™ has become an invaluable input, particularly in vegetable and fruit production, where huge N-P-K starters reign supreme, and calcium, magnesium and boron are often the minerals most missing. The simple addition of a few foliar sprays with Trio (CMB)™ has seen broccoli crops lose their hollow stems and cauliflower heads that don’t go mouldy for weeks in the cold room! Trio (CMB)™ contains three of the “Big Four” essential plant elements. The Big Four are the minerals we try to maintain at luxury levels in plant tissue to maximise yield potential, crop quality and resilience. The “Big Four” minerals are all directly involved in photosynthesis and include calcium, magnesium, boron and phosphorus. Trio (CMB)™ features the first three of this quartet in readily plant-available form. Trio (CMB)™ was originally designed as an accompaniment to Triple Ten™, the largest selling NTS liquid in over 40 countries. Triple Ten™ contains a complex formula of N-P-K and trace elements, however it lacks calcium and magnesium, and only contains a relatively small amount of boron. Many of the leaf tests we look at reveal the need for a further calcium, magnesium and boron boost, hence Trio (CMB)™ was developed. Used as part of a complete program (e.g., alternating with foliar sprays of Triple Ten™), all essential plant minerals are covered, along with a host of bio-stimulants and plant growth promotants. If you have not yet tried the Triple Ten™/Trio (CMB)™ combo, you are in for a very pleasant surprise. Foliar fertilising, when done properly, can be many times more efficient than soil feeding, and when the full requirements for plant nutrition are foliar applied, there can be an impressive crop response.